We're in the thick of it. I'm willing Fall to be present here in California. Have even found some leaves changing colors! We drove into Poway last weekend for a Train Festival (pics to come) and enjoyed the scenery. See? See? OK, it's not the Midwest, but the colors are lovely. Coco sent me this darling wine glass to add to my collection. Lainey loves the witch. How fitting. Halloween cards have been ordered and are en route to our casa now. Only printed a few this year, so don't be a hater if you don't receive one. We're currently live on Ramen noodles and the fruit we can steal from our neighbors' trees. Times are tough, peeps. But, we settled on this one. Super cute punks. Before packing up to go to the beach recently, I popped a frozen gummy eyeball in each of the kids' thermos cups. Spooky fun. Did you know Batman is famous? We've been eating Batman cookies like mad around here. And, we "booed" our neighbors last night. Surely you've heard of this tradition. 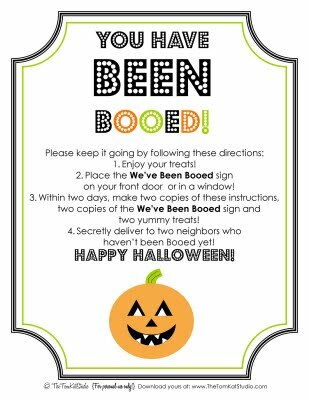 Read the instructions on this sheet, which we included with another sheet to hang in their window letting everyone know they have been "booed".....with treat bags, too. I downloaded my templates from this site. Her blog is awesome. Sign up to follow and stick around. We sat outside to fill our treat bags......and headed out into the neighborhood in Halloween pjs that glow in the dark. Bonus. Lainey had to be escorted home after not entirely understanding the notion of giving the treat bag she so carefully assembled to someone else. So, sweet Daddy took her home to fill her own. We never made it to a house without revealing ourselves (which is the point on the game), but we delivered them nonetheless. Next up? The Pumpkin patch. Have you found yours? The usual, awesome list is located at this link. You are so cool! You move into a new neighborhood and start to "Boo" your neighbors! We did that to each other at school when I taught. It was so much fun! Love the glow in the dark P.J.'s! I bet the kiddos loved it! Love that Boo idea! I might look a little stupid doing it though since we don't have kids? I kind of miss my college days of living off ramen noodles...I kind of really like them. I wonnder if Dave would notice if I mixed them into dinner. Everytime T is here, he says, "Alli, will you make me some ramen noodles?" Silly boy. Love Lainey's expression in that pic. And your witchy wine goblet??? Heart it. Big time. I love, love, love Lainey's Halloween outfit! We did the boo thing last year in our neighborhood. However, it wasn't a hit! Our neighbors are such rednecks and no fun whatsoever! I love "booing", remember when we did that at michaels? I might need to start that here....think i will. LC's face in the pic of the 3 kiddos...kinda funny, kinds scary-love it! Great pictures of the punks! I love the "booed" tradition. Ellery has very specific ideas about whom she would like to boo and what their backs should consist of. Are you going to Bates' Farm for the pumpkin patch? It is the best around, but a bit of a trek. Merrilee - we just got back! Awesome place.....I agree......looks like the best around. I searched via the link I put on this site and it proved to be good! Everyone smiling in a picture! Awesome! Love being boo'd! We just delivered our boo treats last night. So much fun! The trees look pretty there. I'm jealous. Although our weather has been pretty nice here in TX. I joined a PTA group and we got boo'ed! Then I had to boo 2 people and it was so anxious b/c I didn't want to get "caught"! It was fun! "Lainey loves the witch. How fitting." "...so don't be a hater if you don't receive one. We're currently live on Ramen noodles and the fruit we can steal from our neighbors' trees. Times are tough, peeps." You're the best blogger ever. So true to your Casey self. You write how you talk. I wish everyone knew how much!!!! Love you, the punks, and the Blake. Miss you around here. I honestly lived on Ramen in college and still to this day LOVE them! Hagen agrees...he LOVES noodle night!! I love the BOOing idea and I've never heard of that!! So cute. I bought Hudson those glow in the dark skeletonPJ's this year too. Love them. I love your sense of adventure and how you just dive right into everything. Your kids are going to have so many awesome memories, Case! You and Blake are such great parents. Seriously. You send out Halloween cards? I should have known you are that awesome. Cute. So cute. Good pics of the kids.